Last year, Converse redesigned its iconic Chuck Taylor sneakers for the first time in almost 100 years. 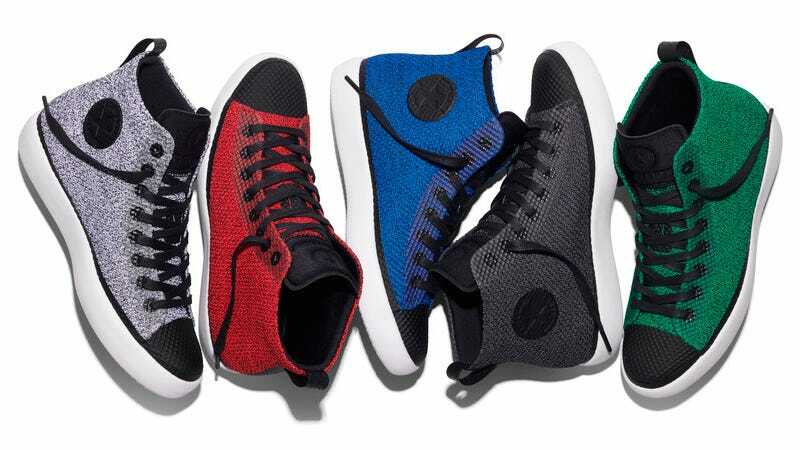 The new version of the kicks went over so well that now Converse is updating its classic All Stars too with a modern take that replaces the canvas uppers with a lightweight and breathable knitted material. Don’t point a finger and accuse Converse of stealing Nike’s Flyknit material, though. Back in 2003, Nike bought converse after the iconic brand filed for bankruptcy, so the the two companies are now one and the same, and free to share each other’s technologies and designs. Available in both hi-top and low-cut styles, the Converse All Star Moderns are reminiscent of the originals from way back in 1920, but also feature Nike technology, including the breathable “Hyperfuse” fabric the sneaker giant uses in its running shoes, and a lightweight “Phylon” foam sole. The All Star Moderns come in your choice of five different colors accented with black toe caps, black laces, and black eyelets. The new shoes are sure to be more durable than the canvas oldies, but jumping into the future is going to cost you. The All Star Moderns will be available starting on June 16; the hi-tops will set you back a hefty $140 per pair, while the lo-tops will cost $130. Apparently premium pricing is another feature Converse has adopted from its parent company. Those are the cheaper kicks, though. To help introduce the new collection Converse will also be releasing a limited edition version called the All Star Modern HTM designed by Nike’s Hiroshi Fujiwara, Tinker Hatfield and Mark Parker—hence the HTM moniker. Thanks to a white or black upper made of goat leather, the limited edition HTMs will be made available starting on June 9 for a hefty $180. Ouch.